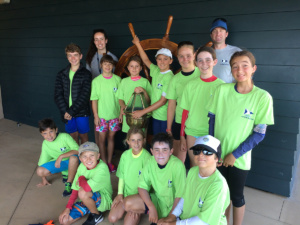 The Junior Sailing Program at Silver Gate Yacht Club is supported by the Silver Gate Yacht Club Foundation, a 501-C3 non-profit organization with the mission of sponsoring non-profit and charitable events and programs at the club. 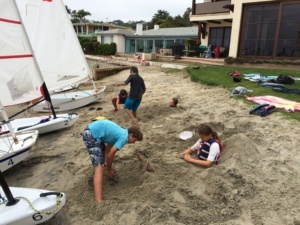 Silver Gate Junior Sailing invites all kids in our community to participate. Club membership is not required. SGYC junior sailing supplements our summer program with a series of weekend sailing opportunities during the fall, winter and spring months. SGYC junior sailing supplements our summer program with a series of weekend sailing opportunities during the fall, winter and spring months. 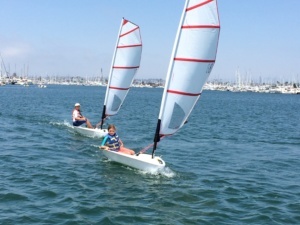 These Sunday sailing sessions offer our juniors an opportunity to refine the skills they learned during the summer, tune up for some racing or just enjoy a leisurely time on the water with old friends and new. 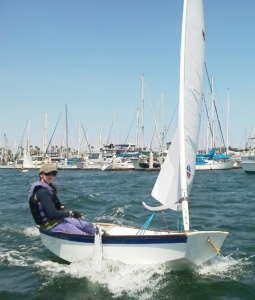 These fall/winter/spring programs are intended for sailors with at least one week of summer instruction in our program or another similar youth sailing instruction program. NOTE: This is not a learn-to-sail program for first-time beginners. Participants must have prior experience with our program or approval from the Director. We have a fleet of the exciting new O’Pen BIC and RS Feva boats as well as Naples Sabots and a Hunter 216 keel boat. The Juniors will also have the opportunity to sail a Hunter 216 sloop under a coaches’ supervision. Our Sunday Sailing Series runs from 9:00 to 3:00 p.m. Most of the time is spent on the water. Sailors return to the docks for a lunch break. Juniors should bring their lunch and any snacks or preferred drinks. SGYC will have plenty of bottled water available. 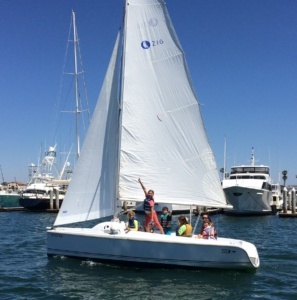 COST: The cost of our 7 session Sunday Sailing Series is $320.00 for SGYC members and $360.00 for non-members. Use of SGYC Jr. Sailing fleet of boats is included in the program cost. This program is open to all juniors age 8 to 18 with some prior sailing training, and SGYC membership is not required. NOTE: This is not a learn-to-sail program for first-time beginners. Participants must have prior experience with our program or approval from the Director. Refer to the Parent Resource Guide available on our web site for additional helpful information. HEALTH AND SAFETY: Each sailor must provide a completed medical consent form. Additionally, each sailor is required to complete 25-yard swim verification and be able to tread water for 1 minute without a lifejacket. All on-water activities that junior sailors participate in will be accompanied by the instructors in power boats (“coach boats”) for added safety. TRANSPORTATION: Parents of junior sailors must provide their own transportation to and from SGYC. Ample public parking is available across Shelter Island Drive from the club. Juniors are expected to leave the premises by 4:00p.m. No after-hours supervision will be provided. Juniors under the age of 16 must be met by their parents on SGYC property.